How Dangerous is Aluminum Wiring in Your Orange County Home? You are here: Home » blog » How Dangerous is Aluminum Wiring in Your Orange County Home? Posted in blog | Comments Off on How Dangerous is Aluminum Wiring in Your Orange County Home? Aluminum wire is a type of wiring which is used in houses, power grids and airplanes. Aluminum provides a much better conduction than copper and is much cheaper. However, just being cheap can cost lives since aluminum is dangerous and can cause fire to buildings. Yes! Fire. It may appear to be harmless but the dangers of aluminum wiring can be so unbelievable. One of the biggest problem with the aluminum wiring is actually not with the wiring itself but with the end connections which leads to oxidation. Aluminum oxide, a white powdery substance, forms on the surface of the aluminum due to moisture. When these wires start to oxidize on outlets or switch it stops conducting electricity. Due to this, the connection becomes a resistor and as we all know the resistance causes heat; enough heat because of the oxidation and a fire can outbreak. Unlike other metals, aluminum expands and contracts at a faster rate than copper. There are wires in attics or close to the roof for some and when its hot these wires expand then when its cold they contract. This constant expanding and contracting affects the terminal screws in the outlets and switches causing them to loosen leading to a poor connection. This poor connection leads to too much heat which can cause a fire. Make sure to consult an electrical service professional for advice on dealing with this. An experienced wiring specialist in Orange County knows that he should not nick a wire when stripping to make connections.These same little nicks create stress point which leads to wire breakage and so there are special tools to do these tasks so that only the insulation is cut. 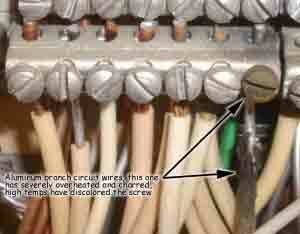 An unqualified person trying to do this will perhaps use a knife to strip the insulation and end up nicking the wire. With time, the wire will break at the nick point which will lead to shorting out and sparking and eventually to a fire. So make the right choices, do not make choices depending on the price, think about safety first.